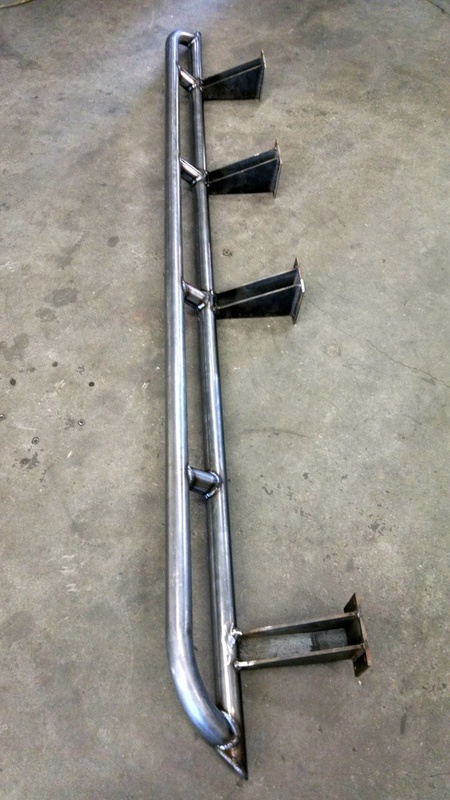 We have been in the design stages of building some quality rock sliders that will hold up. Here is a solid works peak into the the new design. Always curios to see what you think and who might be interested. Would they be able to handle the weight of the van better than this? The running boards on my 4Runner have lights on each end which are very handy. Have always thought that when I get sliders for it would want to incorporate some lights tucked between the rails. Those sliders look mighty nice. What do you think the cost might be? ^^^ id also like a rough idea of end user cost. if the picture shows the aluminess product, those are marketed as nerf bars, not rock sliders. big difference between the two. nerf bars are basically just steps for easier access into vehicle. rock sliders are designed for just that, sliding on rocks and protecting your vehicle. the idea is that your rig will high center on said slider before damage occurs to chassis/body. not bend like that step did. weldtec, is that picture upside down? ive seen rock sliders that do angle up to protect more of the body and ive seen some that double as a step. a rendering on a vehicle would be a lot easier for us to visualize the end product you have in mind. i would be interested in a good rock slider, but also need a step system as well. the carr steps i currently have work fine, but i like the looks of the nerf bar style steps. they would just hide what hangs low on my van better. ideally, id like to have something similar to the aluminess product that would double as a rock slider but i would want the actual step to go full length, not just a small area under each door as pictured by twovans. We are currently making 2 styles of tube slider, a weld on that is permanent and a weld on bracket that bolts to the outer slider. The one pictured here are a bolt together type. If you would like a step we can add one or you can have the tube run down. Once the main platform is done it easy easier to modify them for your personal needs. Ballpark price of $1000[quote="shenrie"]^^^ id also like a rough idea of end user cost. That is exactly my point. The drawing looks like a nerf bar. 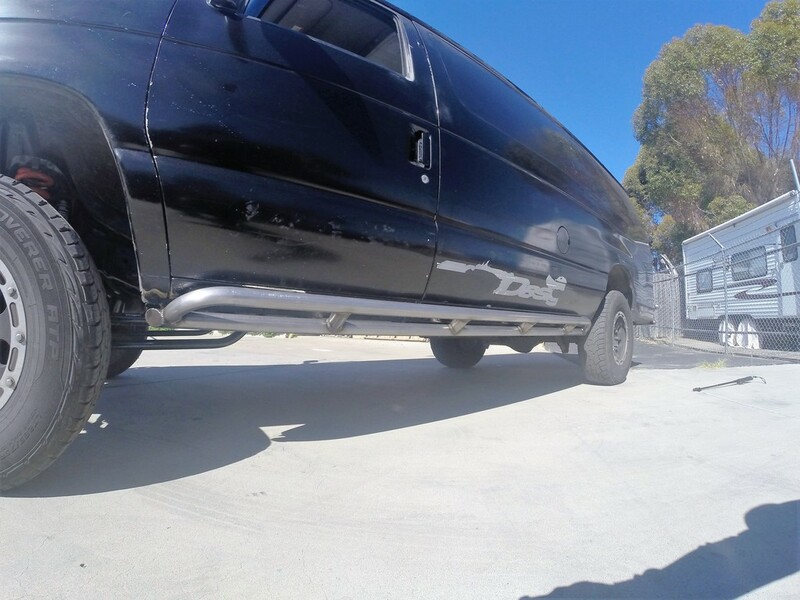 How has it been designed to handle the weight of the van so it functions as a slider and doesn't result in the damage to the nerf bar pictured when subjected to the van's weight? ^^^ ill let weldtec provide specifics, but the fact that they arent aluminum and have the three vertical supports will make a big difference alone. 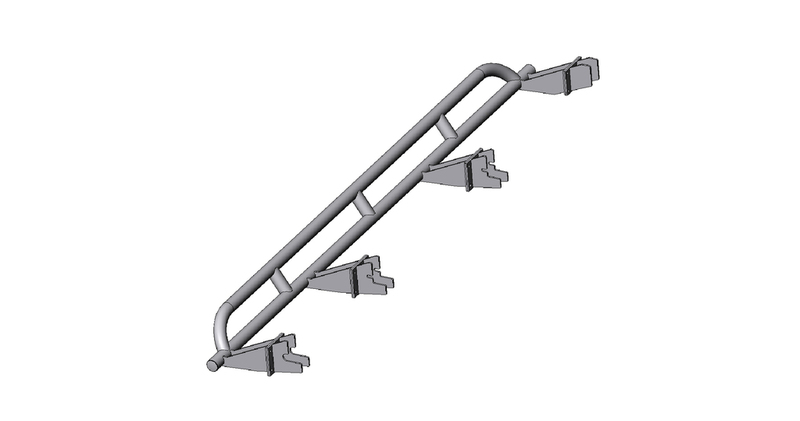 We will be selling just the brackets, due to the possible cost of shipping the complete slider welded up. Here is a look at the first set. They look great, but will they work on a sportsmobile with all the equipment along the frame. If so, I would be very interested.